The Madhya Pradesh government has “accepted” the demand to hold public hearing on the rehabilitation of tens of villages of Dhar and Badwani districts in Narmada valley ahead of any displacement orders due to the Narmada dam, currently under construction up to the full reservoir level of 138.64 metres. Badwani district collector Ajay Singh Gangwar gave the assurance to the protesting farmers, fisherfolk , tribals and agricultural workers of Pichhodi, Bheelkheda, Kasravad, Dhanora, Chhota Barda and other villages, which have been allegedly “wrongly assessed” has having complied for rehabilitating them. 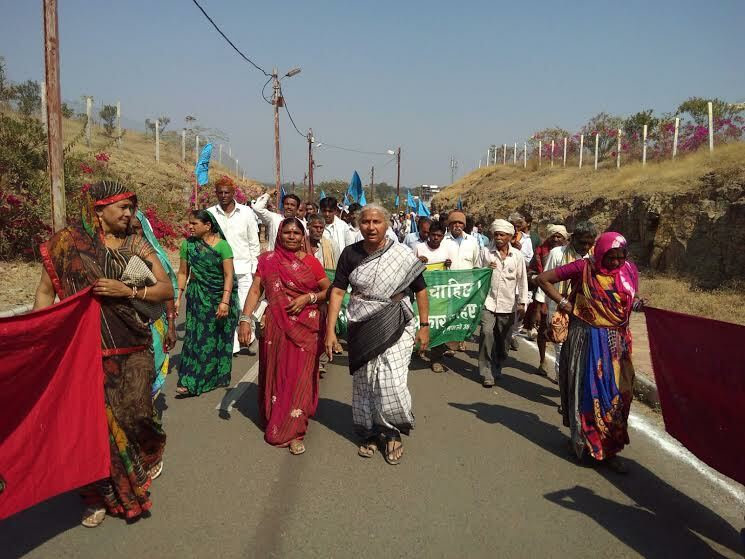 The protesters, who were led by Narmada Bachao Andolan (NBA) leader Medha Patkar, said, resettlement sites were being prepared without obtaining legal mandate from the village panchayats, pointing out, 90 per cent of the 50,000 Narmada dam oustees, residing in their original villages, "await new entitlement". The protesters, who had gathered at the district collector’s office in Badwani on February 9, sought the state government assurance that special gram sabha should be called in village before any rehabilitation plan was put forward. 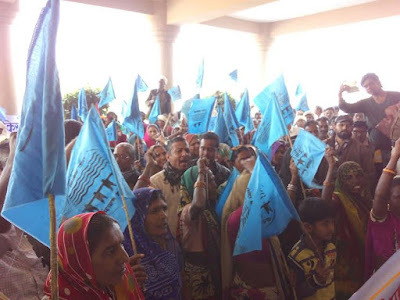 “The district collector was told that, under the Panchayat Extension of Scheduled Areas (PESA) Act, it is compulsory to call gram sabha in tribal dominated villages and consult all the villagers on issues related to land acquisition and rehabilitation”, an NBA communiqué issued after the protest said. “Other issues raised included the farmers’ right to optimum prices for the farm produce, the loot through the corporatized crop insurance scheme, compensation for the crop affected by natural calamities, forcible land acquisition, and diverting agricultural lands to the corporates”, the communiqué said. “The compensation given by the government without timely, complete, and perfect valuation of losses has been in peanuts and has left out thousands of farmers in the lurch”, the communiqué said. It pointed out, even the highly-publicized promise by chief minister Shivraj Singh Chauhan, of compensation of Rs 8,000 per hectare (ha) has not been fulfilled. “The farmers deserve just and equal treatment quite like the corporates”, it insisted, adding, their demand is to raise the purchase price by Rs 2,200 per quintal for wheat, Rs 2000 per quintal for maize, jowar (millet), and bajra, and Rs 1000 per quintal for banana, papaya and other fruits. A representation by the Jagrut Dalit Adivasi Sangathan said corporate favouritism stood in sharp contrast to “injustice” being meted out to the Mahatma Gandhi National Rural Employment Guarantee Scheme (MNREGS) labourers. Medha Patkar appreciated the district collector’s three hour long patient hearing to hundreds of men and women along with the representatives of people on the issue of prices for agricultural produce and compensation. This, she said, sharply contrasted to “slogan-mongering” Shivraj Singh Chohan government”, pointing out, he hoped that the collector would “take up all issues at state level and convey then to the chief minister.